The MiG-35 is capable to fight air, land and maritime targets equally well. Known for its formidable air maneuverability, it could be a viable alternative to the French Rafale for India. A short run, a sharp, nearly vertical level off, and the fighter is spinning in an intricate air waltz. Straight run picking up speed, but instead of a spectacular exit from the visibility zone there comes almost full braking with the entire fuselage surface. The plane literally stands up on the tail, with its nose vertically in the air. Then drops down. Previously, only Sukhoi jets with their variable thrust vector engines Su-30MKI ordered by India could perform such kind of tricks. Short runs, sharp braking and maneuvers unimaginable for an aircraft give the pilot tactical advantage in the aerial battle - the dogfight. Today this air superiority monopoly has been broken by another Russian fighter jet - MiG-35. 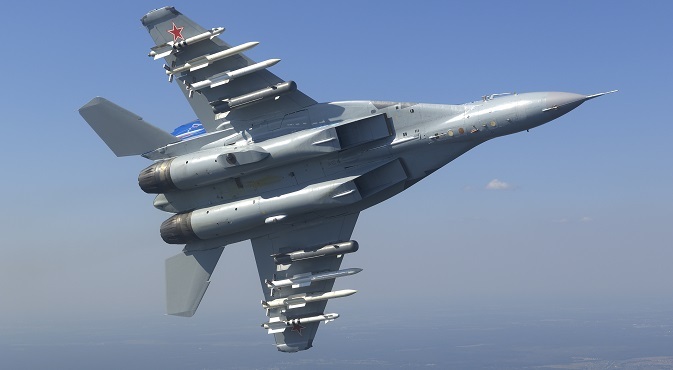 In March-April this year, the MiG Corporation is expected to sign a state contract to conduct R&D on the MiG-35, which will be designed according to technical specifications of the Russian Air Force, a source in the defense industry told Interfax agency. Externally, MiG-35 is no different than a regular MiG-29. The mould lines are the same, but the cockpit cap is quite different - fully in glass, as in the latest American fifth-generation fighter F-22 Raptor and the Russian T-50. The cockpit of MiG-35 doesn't contain pointer-type equipment anymore. Only LCD panels that display the complete flight and combat information. It's the prototype of the fifth-generation fighter cockpit, says Givi Janjgava, head of Technocomplex, the company that develops modern avionics for Russian aviation. The second know-how is the newest engine RD-33OVT by Klimov construction bureau. Its nozzle can rotate in any direction, not only during the regular flight, but also in afterburner. This feature makes MiG-35 radically different from the aircrafts such as Su-30MKI or the American F-22. Simply put, MiG is more maneuverable and controllable in all modes, at high speed and at no speed. The MiG-35 is capable to fight air, land and maritime targets equally well. The fighter jet is equipped with Zhuk-ME radar, with terrain mapping mode. The range of guided and unguided air armament used has been largely expanded. Unlike its earlier versions, the fighter is able to carry 6 tonnes of combat load instead of 4 tonnes, which brings its capacities closer to heavy fighters (up to 8 tonnes of combat load). Not long ago, MiG-35 participated in an Indian tender for the supply of 126 light fighter jets for $10 billion. The battle was won by French Rafale. The reason cited was its technological advantage over the competitors, coupled with the promise of Paris to transfer the aircraft's key production technologies to New Delhi. However, the two sides have still not agreed on the final cost of the machines or about New Delhi’s demands for production technology transfer. India’s Defence Minister Manohar Parrikar said recently that the Rafale deal was proving to be too costly for the country: the company Dassault Aviation has doubled the price per aircraft from $65 million to $120 million. This would bring the entire consignment of 126 machines to cost $28-30 billion, instead of $10 billion. In addition to this, equipping the fighter with missile and bomb weapons also impose heavy financial burden. India’s Minister of State for External Affairs V.K. Singh also noted the price attractiveness and reliability of Russian multi-role fighters Su-30, produced under license in India, in comparison with the French Rafale. As a result, Delhi may have to opt out of the Rafale deal. It is possible that the Indian military will now turn its attention again to the Russian light fighter MiG-35, which can be used not only from land aerodromes, but also from the aircraft carriers. It is in this form that the Russian military is going to purchase it.